Leaving aside that President Obama spent his first eleven days in office undoing every Bush Policy that he could find (certainly a sign of individuality), the assertion of this piece lies in direct contradiction to the fact that the President wore at least two neckties that were neither red nor blue during his first eleven days in office. On January 26th, President Obama signed an executive order enabling fourteen states to set strict limits on greenhouse gas emissions and fuel efficiency for cars and trucks. He is pictured below during the signing of this “green” legislation wearing a dark green tie. To their credit, the NY Daily News did include this tie in their analysis, they just inappropriately labeled it as dark blue. Neck of State has analyzed several photos of the President from the 26th of January, and in all of our tests, the tie came up as more green than blue. 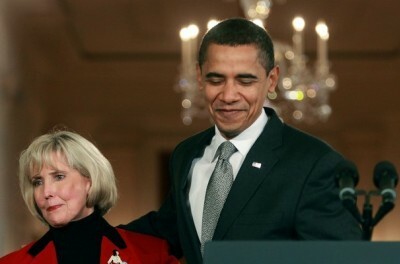 Just a few days later on January 29th, Obama posed with Lillly Ledbetter, the namesake of recent legislation that makes it easier for women to file fair-pay lawsuits. His tie in the snapshot below is not only neither red nor blue, but also carries a non-traditional “static” pattern. Together, these tie choices represent more than 20% of the ties that the President wore on business days during his first eleven days in office. 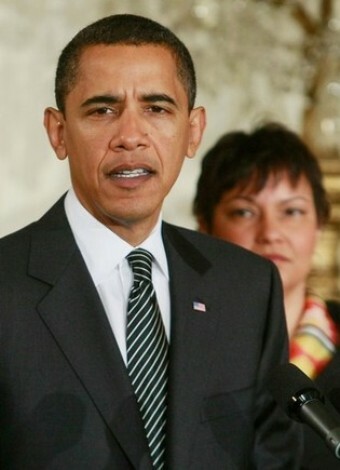 Pictured above are President Obama’s neck ties for his first nine business-days in office. From left to right are the ties he wore on January 20, 21, 22, 23, 26, 27, 28, 29, and 30 of this year. At Neck of State we carefully catalog the President’s ties every day, and we will never report based on preconceived notions of Washington D.C. fashion. We look forward to sharing the patterns that emerge with our readers as we continue our research. For pictures of all the ties that the President has worn since taking office, please visit the Tie Gallery. Daily News story via Yahoo News.